The Hans Christian Andersen strategy? Although Charlie Ergen has his Seinfeld strategy for exploiting DISH’s new assets, including DBSD and Blockbuster, Harbinger’s plans for LightSquared are becoming ever harder to discern, with news today that LightSquared is “considering a deal with AT&T to buy network capacity from the carrier”. Presumably this story comes in response to concerns that LightSquared might be forbidden from operating its L-band terrestrial network indefinitely, if new language in the National Defense Authorization Act passed by the House of Representatives last week is ultimately included in the final bill. At the very least it now appears that the FAA will insist that LightSquared’s operations be confined to only the lower half of its 40MHz of L-band spectrum, while John Deere contends that “permitting LightSquared to operate its network as proposed or any variant of its currently proposed network will create massive interference into Deere’s StarFire system and other similar systems risking serious harm to the U.S. agriculture industry”. This news marks yet another 180 degree turn in LightSquared’s ever-changing story, which over the last year has shifted from a $7B contract (or rather MoU) with Nokia Siemens Networks (which disintegrated in January) to a joint bid with MetroPCS for DBSD to a network sharing agreement with Sprint (which at one point was supposedly even going to supplant Clearwire) to now an “initiative” with AT&T, along the way apparently including talks with Cablevision, Time Warner Cable and any number of other companies. This extraordinary saga reads like something by Hans Christian Andersen, the only question being whether the final tale will turn out to be “The Ugly Duckling” or “The Emperor’s New Clothes“. Meanwhile, the FCC appears to be doing its best to make the TerreStar bankruptcy auction even more confusing, releasing a Public Notice on May 20 which “invites technical input on approaches to encourage the growth of terrestrial mobile broadband services in the 2 GHz spectrum range”. Unfortunately for TerreStar, the FCC once again insists that “the public interest” requires that “any grant of terrestrial rights in the 2 GHz band [should] have ‘conditions designed to ensure timely utilization of the spectrum for broadband and appropriate consideration for the step-up in the value of the affected spectrum’” in the form of “Voluntary Incentive Auctions” or “Voluntary Return of MSS Spectrum Rights”, thereby potentially reducing the perceived value of TerreStar’s MSS spectrum in the upcoming auction quite significantly. Of course, things are not looking that great for the FCC’s other attempts to bring additional spectrum into use for terrestrial mobile broadband (i.e. LightSquared and broadcast TV incentive auctions), so perhaps the buyer of TerreStar’s spectrum will simply tell the FCC to go pound sand, and continue to pursue a (loss making) satellite-based business plan until a better offer is on the table. However, in those circumstances, whoever buys TerreStar would need to have deep pockets, and be happy to wait for several years rather than seeking a quick flip of the spectrum. Given Harbinger’s experience with LightSquared, that might well put off some of the financial players who could otherwise have been interested in TerreStar’s spectrum. Over the last week, a clearer picture has begun to emerge of LightSquared and the GPS industry’s respective strategies, as interference tests continue in Las Vegas. 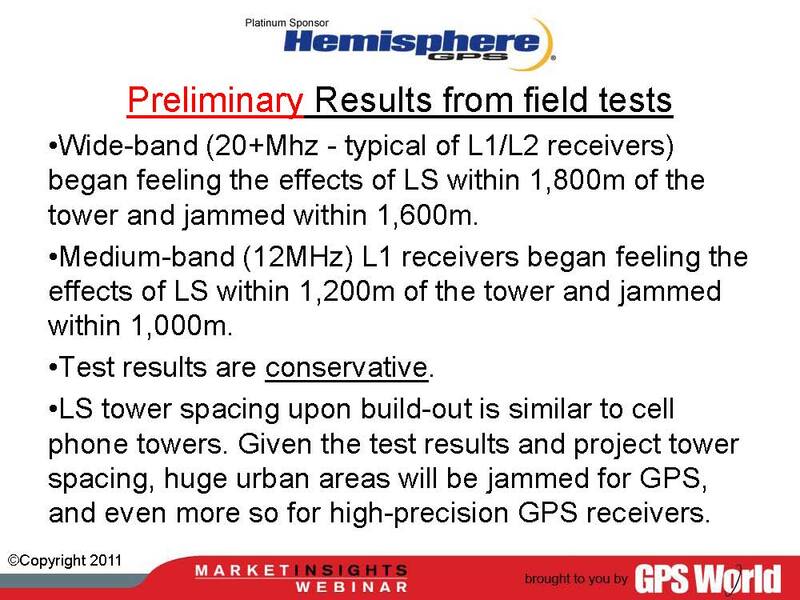 Some data is now emerging from these tests, with a GPS World webinar this morning citing that in a rural test case (see presentation), high precision receivers were impacted up to 1800m from the base station (although the radius of interference would obviously be less for narrowband GPS receivers and for more urban environments with higher levels of clutter). Given that the problem is mainly caused by transmissions in the upper channel (Phase 0 spectrum) closest to the GPS frequencies, LightSquared is already indicating that it will offer to operate only below 1545MHz, until the FCC introduces receiver standards and old GPS equipment is phased out (a process that will take many years to complete). As Jeff Carlisle of LightSquared commented in a May 23 Space News article: “If the most efficient and fair solution is not to do a receiver-side solution, we haven’t taken any of the possible transmission solutions off the table. We can look at ways of implementing our service, how we do it, when we do it, using what spectrum”. Indeed LightSquared has just paid Inmarsat another $40M to speed up the availability of the Phase 1A spectrum, and moved back its commercial deployment timeline into the first half of 2012 for precisely this reason. However, as problems have emerged with the testing in Las Vegas, it appears that the GPS industry will demand that significant additional testing must be carried out, before LightSquared is given permission to launch commercial service even in the lower part of the band. As Alan Cameron of GPS World put it on this morning’s webinar, LightSquared does not have the full software [needed to operate its base stations in the way it plans to do commercially] so the current testing is premature. A letter sent to the FCC last week, signed by 33 senators, even asks the Commission to “rescind LightSquared’s waiver until this demonstration [of non-interference with GPS] is made”. Of course, as everyone should know, a demonstration of total “non-interference” is impossible. Next week we should expect to see more data on the government’s testing of interference in New Mexico, based on the charter of the National Space-Based PNT Systems Engineering Forum, which was tasked to produce a final report “in a publicly releasable version” by May 31, 2011. Indications to date are that this testing certainly does not demonstrate “non-interference” with GPS (and the report itself will written by proponents of GPS not LightSquared), so this is likely to intensify the political firestorm aimed at LightSquared and the FCC. UPDATE: The FAA report is also scheduled to be released on June 3 and, according to a report in FlightGlobal, the conclusions also appear to be problematic for LightSquared, notably a statement that “From an aviation perspective, operations at Phase 0, 1 and 2 spectral deployments, the upper channel [frequencies above 1536MHz] should not be permitted”. FURTHER UPDATE: The FlightGlobal article has now been taken down, but is still available here and a more complete report on the study is available here. Also the House of Representatives has now passed the National Defense Authorization Act (NDAA), with strengthened language apparently requiring that the FCC should not provide “final authorization for LightSquared operations until Defense Department concerns about GPS interference have been resolved”. If that bill passes the Senate and is signed by the President, then it would seem likely to stop any prospect of near term commercial operations by LightSquared. Of course, a requirement for more testing and a further delay to LightSquared obtaining permission to commence service (at best) or a withdrawal of the waiver (at worst) could very easily derail the LightSquared venture completely. I’m told that LightSquared had been hoping to raise money from private equity sources and then undertake an IPO in July, after signing a provisional network sharing agreement with Sprint. This new funding is a pre-requisite for Sprint to move forward with any buildout under the network sharing agreement, because of the upfront costs that it would incur, and so Sprint needs to be convinced that LightSquared will be able to reimburse these costs, either with cash or spectrum rights. With Sprint expected to announce its plans for Network Vision this summer, LightSquared therefore needs to achieve some certainty about its spectrum position very soon, or risk missing that boat. Ominously, at a New America Foundation event in Washington DC two weeks ago featuring LightSquared’s CEO, Sprint noted that it would be able to host other spectrum on its Network Vision platform, including “possibly Clearwire, possibly public safety”, but conspicuously failed to include LightSquared on that list. Today, it was reported that LightSquared has revised its deployment plans, and now expects “field trials in the third and fourth quarter this year in Baltimore, Las Vegas and Phoenix” followed by “a ‘full-blown commercial’ launch…scheduled for early next year” rather than “by the end of this year” as was indicated in April. Even that was slower than in January, when LightSquared suggested that it was “testing LTE in Baltimore, Denver, Las Vegas and Phoenix now” and was “expected to launch up to nine Midwest markets this year”. Back in January, LightSquared was granted a waiver by the FCC, based on commitments that the company was “confident that this [GPS interference] issue can be resolved without delaying deployment of wireless broadband, generally, or the LightSquared network specifically” and that “LightSquared was cognizant of this issue when we made the buildout commitments that served as the basis for the Commission’s own requirements in its March 2010 Order”. Indeed LightSquared also indicated that it would not “continue to roll out our network and meet the rigorous construction timetable that the Commission has made a condition of our authorization” unless the FCC takes “quick, favorable action” to approve its updated business plan. However, despite the FCC acceding to LightSquared’s waiver request, based on these assurances, it now seems that LightSquared will delay the rollout of its network and blame the GPS interference issue, saying that “the company is watching the FCC before fully rolling out its ground-based network”. It would be understandable if in these circumstances the FCC was becoming somewhat impatient with LightSquared’s progress, and LightSquared’s CEO has recently been doing the rounds of FCC Commissioners, presumably with a view to shoring up LightSquared’s support at the FCC. UPDATE: LightSquared has told DSLReports that “they’ve always planned their first commercial launch to be in early 2012″. Of course that’s not what LightSquared told the FCC in March 2010, who quoted as part of their public interest rationale for approving the Harbinger takeover that “Service will begin in two trial markets with a commercial launch commencing before the third quarter of 2011, providing service for up to 9 million POPs”. Looking at LightSquared’s latest statements in more detail, it also appears that Denver has been dropped from the original deployment plan (indeed back in March 2010 LightSquared told the FCC that “service will begin in two trial markets, Denver and Phoenix, with a commercial launch before the third quarter of 2011 providing service to up to 9 million POPs”). It isn’t terribly surprising that the initial rollout will now take place in Las Vegas, because that is basically the easiest major city in the entire US to cover with a wireless network, due to the lack of foliage and the flat terrain. 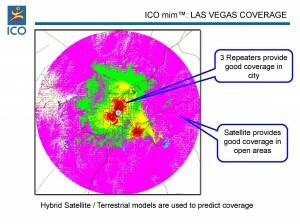 Indeed, ICO (now DBSD) was able to cover the city very well (albeit without the intention to provide indoor coverage) with only 3 base stations, during trials of its MIM service in 2008, as shown in the diagram below. In Phoenix, I’m told that LightSquared’s site acqusition partner shut down its operations back in January, and at that point the tower companies were no longer being paid rent for the 20 site leases that had been signed. In Baltimore I understand that only a very limited proof of concept deployment was planned (with a handful of base stations at most), to determine the extent of interference with Inmarsat’s maritime safety services. Given this information, unless something significant has changed in the last few months, it seems that at best only a minimal deployment effort is taking place ahead of the potential network sharing agreement with Sprint, and associated contract with Ericsson, that everyone expects to emerge soon (and which today’s Clearwire agreement with Ericsson presumably provides a template for). GPS interference: Who knew it would get this bad? As more information starts to emerge from real world testing into whether LightSquared’s terrestrial network will interfere with GPS receivers, the news appears to be fairly bad for LightSquared on both the technical and political fronts. In addition to Qualcomm’s comments last week, suggesting that the filters in their A-GPS chipsets might need to be upgraded, New Mexico state officials have submitted a letter stating that their testing “substantiate[s] concerns that the LightSquared network will cause interference to GPS signals and jeopardize 911 and public safety nationwide”. Meanwhile the FCC has been asked by Sen. Chuck Grassley (R-Iowa) “for more information on its review” of LightSquared’s plans, including “all communications between the FCC and Falcone or any other Harbinger Capital and LightSquared employees [and] all internal FCC communications regarding LightSquared or Harbinger Capital” and language has been included in the National Defense Authorization Act (NDAA) that “requires the U.S. Secretary of Defense to notify Congress if he determines that widespread interference with the military’s use of the GPS is caused by a commercial communications service”. What I’ve always found intriguing is that this issue apparently came out of nowhere to potentially derail the whole LightSquared buildout plan. 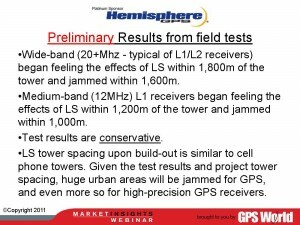 LightSquared has highlighted that terrestrial use of the L-band has been anticipated since 2003, and that the GPS Industry Council negotiated several agreements with LightSquared (previously SkyTerra and before that MSV) on out-of-band emissions into the 1559-1610MHz band, starting in 2002 and extending right up until August 2009. Indeed in March 2004, the GPS Industry Council urged “the Commission to grant the above referenced [ATC] applications of Mobile Satellite Ventures Subsidiary LLC (“MSV”), and to do so as soon as possible”, commending MSV “for its proposal to use its spectrum in a responsible manner that ensures the continued utility of GPS receivers operating in the vicinity of MSV ATC stations”. However, it appears that the GPS Industry Council never recognized the potential for GPS receiver overload from transmissions within LightSquared’s own L-band frequencies. Given their comments above, it seems plausible that they were lulled into a false sense of security by LightSquared’s cooperation over out-of-band interference, including limiting the PSD to -100dBW/MHz or less, a very aggressive commitment, giving a high level of protection to GPS receivers. Of course, LightSquared also benefited from that commitment, because to filter LightSquared’s emissions to this level requires about 3-4MHz of separation between the edge of the GPS band at 1559MHz and LightSquared’s terrestrial transmissions at 1550-1555MHz. When similarly challenging constraints were imposed on Globalstar at 1610MHz, it meant that Globalstar would be less able to operate high power terrestrial transmissions at the bottom edge of its L-band frequencies, restricting Globalstar’s ability to support ATC in its more limited Big LEO L-band allocation (and thereby hampering potential competition to LightSquared). Given the complexity of these issues and how critical their resolution was in obtaining LightSquared’s ATC license, it is hard to believe that no-one at LightSquared was aware of the possibility of GPS overload interference until it was raised in December 2010. Indeed, in an offhand comment in March 2011, even Mr. Falcone’s wife apparently suggested that “this type of interference has always been a potential issue for GPS”. Nevertheless, it appears that no mention is made of such problems in the risk factors section of SkyTerra’s 10-K filings with the SEC, and the 2009 10-K filing basically states the opposite, noting that “We have also agreed to comply with requirements on our user terminals and base stations that we negotiated with the GPS industry to provide additional protection to GPS receivers, beyond existing mandatory limits. Our compliance with these limits is a condition of our ATC license. All of our broadband wireless system designs take into account these requirements and specifications. We believe that they do not materially limit our network deployment or our ability to achieve our business plan”. Summing up, it seems that the GPS Industry Council clearly dropped the ball when it came to analyzing the potential impact of LightSquared on GPS receivers. However, they may very well feel that they were the victim of a bait and switch play, thinking that MSV/SkyTerra was being extremely cooperative with its expressed intent to “ensure the continued utility of GPS receivers operating in the vicinity of MSV ATC stations”, when in reality out-of-band interference was not most important issue to consider. As testing continues into whether LightSquared will interfere with GPS signals, Qualcomm has filed the results of its own initial cellphone testing with the FCC. Of course, LightSquared is depending on Qualcomm as its principal supplier of chipsets and developer of the GMSA/S-EVDO air interface for its satellite services, so it might have been expected that Qualcomm would confirm the position asserted by LightSquared supporters, that cellphones won’t need to use filters to prevent interference with their A-GPS location chips. However, in fact Qualcomm has come to the initial conclusion that “additional rejection of 30dB may be required” and that the current filters used in its A-GPS chipsets may need to be upgraded, in view of how close the upper part of the LightSquared downlink band (the Phase 0 spectrum at 1550-1555MHz) is to the GPS band. Given that most people agree that the interference problem will likely be much worse for other types of GPS receivers, this is not an encouraging result for LightSquared. LightSquared may therefore be unable to use the Phase 0 spectrum unless receiver standards are imposed on GPS receivers, as the FCC suggested in its recent 2GHz ruling, which indicated that “incumbent users…must use receivers that reasonably discriminate against reception of signals outside their allocated spectrum”. However, Inmarsat indicated yesterday that on April 25, it signed an amendment to its Cooperation Agreement with LightSquared, and received an additional payment of $40M to accelerate the clearing of the Phase 1A spectrum (i.e. to free up the additional 2x5MHz block at the bottom of the L-band, which under the original agreement would have been made available sometime between February and November 2012). Thus it appears that even LightSquared may be acknowledging that the top part of its frequency band will be largely unusable for the foreseeable future, unless and until receiver standards are imposed on the GPS community, requiring a multi-year program of equipment upgrades and recertification, with all of the additional costs and delays that would imply.